I managed to be organised enough this morning to get me and my dog to work today. I thought the big boss wouldn't be there but he was. Luckily he likes dogs. He brought his 2 dogs to work earlier this week. Here is my buddy. 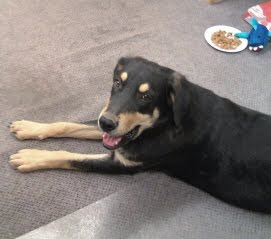 He's a black and tan coonhound/collie mix. I feed him too much. With 3 dogs it is hard to regulate who get the food and he usually gets to it first. I haven't paid his adoption fee yet but once I get the money from my second job he will be mine. He was pretty good at work today. He only barked a few times when he wanted more attention. Someone ordered pizza for lunch and he appreciated the crusts that were handed out. He was scared of going down the stairs but overcame his fear by noon. Having my dog at work is great but I can't say it makes me more productive. I took him for a walk every 2 hours just in case. I didn't want any puddles. I can say that it made me a happier employee so if I am happy then I won't quit and they won't have to train someone new, so bringing my dog once in a while is a good thing, right? You are going to keep this one? Cool. He looks like a good doggy. Does Kitty approve? Yes, he will be mine. Kitty does not approve of any other animal but at least this one doesn't want to eat her (just her cat food). What are you naming the doggy? KoBold, I must not be using the right keywords but I did learn that sled dogs eat moose meat! Big Sis, he came with the name Jimbo but I don't like it. AFAIK sled dogs (on leash) are pegged to place, out of reach of each other. Then they are fed in pecking order (alpha getting fed first). Each gets their portion, none gets to take others'. KoBold, that is what I was thinking. I would only have to restrain my piggy dog. The other 2 don't seem to have a problem.